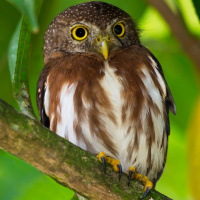 Introduction: The Central American Pygmy Owl is a tiny owl with no ear-tufts. Typical call - Bartóla, Nicaragua. April 2004. CC Stefan Woltmann. Description: The facial disc is pale grey-brown, flecked whitish, with indistinct concentric lines. The eyebrows are short and whitish, and the eyes are yellow. The cere and bill are yellowish-horn with a slight greenish tint. The crown and nape are brownish-grey, the forecrown having tiny whitish spots, sometimes extending to the hindcrown. The nape has a prominent occipital face (false eye spots). The mantle and back are plain rich brown. The pirmaries are greyish-brown with rows of pale spots, while the secondaries are rufous-brown with pale buffish bars. The tail is brown with 4-5 broken whitish bars, 2 of which are concealed by the uppertail-coverts. Underparts are off-white, with a large whitish zone from the throat to the central breast. The sides of the upper breast are mottled rufous-brown, while the flanks and rest of the underparts are boldly streaked rufous-brown. Tarsi are feathered to the base of the toes, which are pale yellowish and bristled. Claws are horn with dark tips. Size: Length 14-16cm. Wing length 85-90mm. Tail length 45-50mm. Weight 50-57g. Females are heavier than males. Habits: Little known. 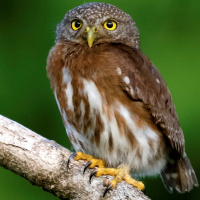 This owl is partly diurnal. Voice: The male's song is a series of equally spaced, hollow, ringing notes at about 2-3 notes per second. The song will often start with a series of 2-4 notes, followed by a series of up to about 18 notes, with various intervals between the series - "pew-pew-pew-pew-pew-pew-pew-pew-pew-pew-pew-pew...". There is also a quavering trill. Hunting & Food: Feeds mainly on insects and spiders, and takes small mammals, birds and other vertebrates. 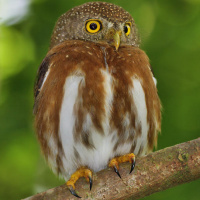 Breeding: Little is known about the breeding biology of the Central American Pygmy Owl. It apparently nests in abandoned woodpecker holes, and perhaps also in openings in old termite nests on trees. Habitat: Humid tropical evergreen forest and humid bushland. Also mature and abandoned plantations and semi-open, bushy landscapes. Ranges from sea-level up to about 1300m. 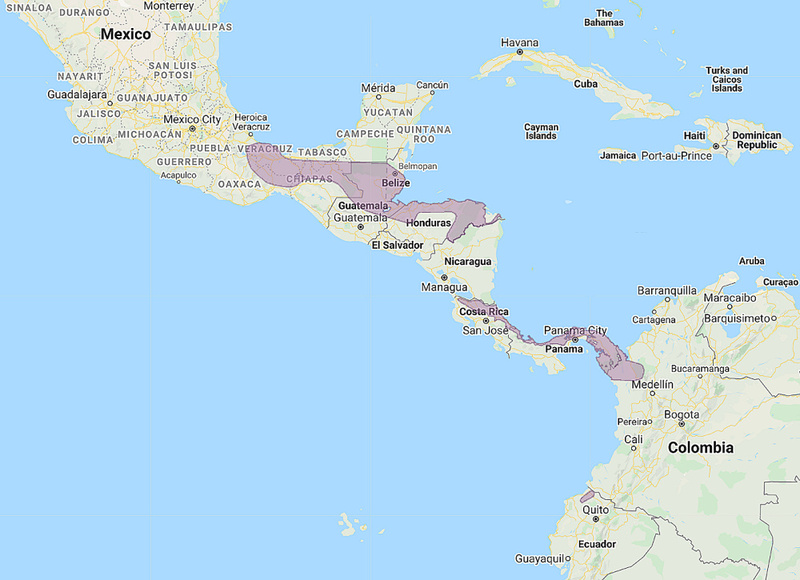 Distribution: Southeast Mexico and Central America to Panama. Original Description: Sharpe, Richard Bowdler. 1875. Ibis, 3rd Series, vol. 5: p. 41, pl. 2, fig. 2.